I had an awesome weekend, but you'll have to wait until tomorrow to hear about it because Monday Posts are set aside to join Java for Meet Me on Monday. My parents have been married for 57 years. Wow 57 years is an amazing achievment, they must be very happy. 57 years?!???? Oh my gosh, that is so wonderful!!! Wow! How blessed you are that your parents have been married so long. God bless them! 57 years! What an amazing achievement. I bet your parents worked hard at getting it right too. Googling to find out what a King's Cake is. Am I out of it? Happy Monday! congrats to your parents! hope you'll share more about your king cake. Did you get the cake from an online New Orleans type place? My mom has done that and it is way better than what the local grocery store can whip up. Happy Monday! Isn't it a wonderful gift to have parents still married? That's how I see it anyway, it sets a good example for us, but it also makes holidays, birthdays, etc., infinitely easier. that is a wonderful achievement for your parents!!! 57 yeears!! can't wait to hear about your weekend! Wow, 57 years is quite an accomplishment! WOW! 57 years!!! That is awesome! :) I just wanted to stop by and say hello from our East TN FB group. You have a beautiful blog! Your answers are ALL GOOD! I'll grab your button for my blog. Hope you can stop by. 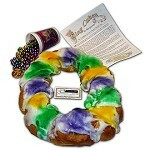 I don't know what the King Cake is either. I love fries too! How wonderful that your parents have been married 57 years.